HANSON — Confusion over how the town should move forward in regulating the sale of marijuana within the town raised some debate as Selectmen voted on Tuesday, Aug. 28 to close the warrant for the Monday, Oct. 1 Special Town Meeting. There will be 24 articles, ranging from housekeeping items, to a new ambulance for the fire department, which Selectman Laura FitzGerald-Kemmett called “self-explanatory”, to a cellphone tower at the middle school. Most articles with a set monetary value were placed on the warrant and recommended, with few exceptions. Several controversial articles were placed, but not recommended, specifically Article 22, which would amend the general by-law to prohibit marijuana sales. This was a point of contention for FitzGerald-Kemmett, Selectmen Chairman Kenny Mitchell, and member James Hickey. While the board as a whole agreed that they did not want marijuana sales in Hanson, according to FitzGerald-Kemmett, and Mitchell and Hickey were vocally opposed, they seemed confused as to how to move forward with whether to recommend the article. “I want to make it clear. I oppose marijuana sales,” said Hickey. Town Administrator Michael McCue jumped in, arguing that a recommendation was to place the measure on the warrant. The board as a whole, especially Wesley Blauss, did not seem convinced. “That’s not how it works with other articles,” he said. The board voted 3-1-1, with FitzGerald-Kemmett abstaining from the vote, which passed, to recommend the article on the STM warrant. The board accepted two donations on Tuesday evening, one from the Hanson Rod and Gun Club and the other from Sullivans Automotive. The Rod and Gun club donated fishing gear, including poles, bobbers and hooks, to the Recreation Commission in the amount of approximately $130, according to McCue. This donation replaced an STM warrant that the police were going to come to the town for this year, according to Mitchell. The board was almost prepared to vote on a Committee Appointment Policy, but upon objections from Blauss to some of the wording, and confusion over definitions by FitzGerald-Kemmett, the appointment policy was tabled until another meeting. Blauss was hung up on a section that required appointees to come before the board for an interview. “What if they can’t make Tuesday nights?” he asked. “I know what the will of the board is,” said McCue, who said he’d “wordsmith” language into the document to please everyone. Another concern was language in the policy stating that appointees must be “of good moral character.” Fitzgerald-Kemmett wanted a definition. A discussion of CORI checking volunteers ensued. Language that would disqualify certain individuals based on their criminal histories is in the document. Fitzgerald-Kemmett wanted to know what would disqualify someone. McCue and Selectmen’s Assistant Meredith Marini stated that they would make that determination, privately. The board will next meet at 7 p.m. Tuesday, Sept. 11. HALIFAX– A man who drowned while boating at Silver Lake Friday, June 3, has been recovered and identified. Shi Hu, 28, of Boston, was found in the water shortly after noon, Sunday, June 5, by State Police divers, according to Plymouth County District Attorney Timothy Cruz. Local officials said that at approximately 1:23 p.m., Friday, June 3, the Halifax Fire Department and the Halifax Police Department responded to a report that an individual had fallen into the water and was struggling offshore from the Brockton-owned water treatment facility located on Route 36, situated on Silver Lake straddling the Halifax/Pembroke line. There were multiple witnesses to the incident, both from the water and shore, saying they believed the victim was fishing with a friend, according to officials. The friend was in a canoe, and the victim was in a kayak, which then overturned. The friend attempted to reach the victim before he went underwater, but was unable to reach him in time. An investigation into how the drowning exactly occurred is ongoing. The victim was not believed to be wearing a life preserver, multiple sources say. During the initial response, employees at the water treatment facility assisted firefighters by shuttling them on a facilities boat to the last known position of the victim. That initial search was not successful, at which time Halifax officials called for assistance from the State Police, Environmental Police and the Plymouth County Technical Response Team (Dive Unit). More than a dozen Plymouth County communities responded, and scores of rescuers from local and state agencies were quickly on scene with specialized equipment, coordinated by Halifax Fire Chief Jason Vivieros. Rescuers suspended the search on Friday evening, after a herculean effort to locate the missing boater with no success. By Saturday morning, the search and rescue mission had grimly turned into a recovery operation. The State brought in a mobile command post and other assets to assist with the recovery efforts. Personnel from as far away as Rhode Island were seen and a staging area for divers was bustling with activity as firefighters, police, and others supported the efforts of divers in the lake from shore. Advanced “side-scan” sonar was used to scour the lake bottom, along with cameras and other technologies, which had very low visibility, say sources. Sonar (sound navigation and ranging) uses sound waves to find and identify objects in the water. Side-scan sonar is a specialized system for detecting objects at the bottom of a body of water. At around 11 a.m., Saturday, about a half-dozen family members of the victim arrived, and appeared to speak with various officials, who sources say updated them on the recovery efforts. They could be seen, visibly distraught, under a tent set up on a lawn near the mobile command post. Local firefighters and police were seen comforting them and providing them with water and other amenities. The family members left after about two hours. Members of the press were politely asked to keep their distance, which they did, although distraught crying could be heard from hundreds of feet away. On Sunday, the decedent was finally recovered, under gray skies and a light rain. Although State Police say they actually made the recovery, they did note that it was a “cooperative mission.” Within a couple of hours, almost everyone had left, leaving behind just a handful of law enforcement and fire officials. Use of the lake is restricted because it is a component of the City of Brockton water supply. “No Trespassing” signs are widely visible around Silver Lake. Motor boats and swimming are strictly prohibited, but other restrictions Brockton puts on the lake were not specifically known. Broderick could not say if the man was trespassing on the lake at the time of the incident. On Saturday, March 5 residents, recovering addicts, those who have suffered loss of a family member due to an addiction, community activists and law-enforcement officers gathered at Whitman-Hanson Regional High School to discuss the problems surrounding substance abuse and including the on-going opioid crisis in the state and country. State Rep. Josh Cutler, D-Duxbury, was scheduled to speak but could not be present due to a family matter, according to forum organizers. His Legislative Aide Rick Branca spoke briefly on his behalf regarding the representative’s efforts in the legislature to tackle the issue, including advocating for a law tightening rules on opiate prescriptions, with versions passed by both the House and the Senate and currently in a conference committee for reconciliation. Branca also spoke of graduating from Whitman-Hanson Regional High School not very long ago, and witnessing too many fellow classmates pass away from substance abuse disorders. Curran said that his problem began when he began smoking marijuana around the age of 13, and that despite not liking the high, marijuana eliminated negative thoughts he was having. But this quickly led him to other drugs. “Less than a year later, I had a needle in my arm,” he said. By 14, Curran was using heroin and other I.V. drugs. He was also smoking crack. This led him to a string of serious life problems, including stints in jail. Today Curran is sober, and putting his life back together. “Addiction doesn’t discriminate; it can happen to anybody,” he said. He went on to describe his thoughts on solving addiction issues. “Punitive measures don’t work,” Curran said. He believes that more vocational programs to teach useful skills to those in recovery would be helpful. Another recovering substance abuser, 36-year-old Sean Merrill, who works as the Executive Assistance/Community Relations Liaison for Teen Challenge in Brockton, a faith-based recovery program for adults, described his story of addiction and recovery. Merrill became an electrician at age 22, and was doing well in life, he said, including buying a house, getting married and having a daughter. But by the age of 25, he and his younger brother began experimenting with opioid painkillers, which he stated led to him becoming “hooked, and losing everything, including his house, his wife, his electrical license and visitation rights to see his daughter. In February 2011, Merrill’s younger brother died due to his addiction. This tragic event in Merrill’s life prompted him to get sober. After getting sober through a Christian recovery program, which he now works for, he and his wife got back together, and they now have two children. “My son has his father back, my daughter has her father back, my wife has her husband back, and my mother has her son back,” he said. Rich Barnes, 48, of Bridgewater spoke next. Also a former substance abuser in recovery, he said he started drinking at age 10. He married in 2000, but said that he was soon spending $10,000 a month on crack and cocaine. “My life was a negative vortex,” he said. But as life continued with a new daughter, and he continued to struggle, he decided finally that enough was enough after a suicide attempt. “I missed the first 2 and a half years of my baby’s life due to addiction,” he said. Now sober for 10 years, Barnes is writing a book with the working title of, “From Stealing to Healing,” and is an inspirational speaker and author of the website richfulthinking.com. Mary Peckham, of Halifax, addressed her son’s death from addiction, in September 2012 at the age of 27. Matthew Peckham was a “normal kid from a normal family,” said his mother. Peckham became involved in drugs in high school, and in a now all-too-familiar scenario, it involved other students trading, buying and selling pain medication prescribed for minor sports injuries or pulled wisdom teeth. Mary Peckham never noticed anything amiss. The secrets began to come out, however, in April 2011, when Matthew Peckham was found overdosing on heroin on his bedroom floor. His drug dealer had sold him heroin that was cut — diluted to increase its weight and volume — with cement. He was brought back to life by first responders with the medicine Naloxone, commonly known by its brand name Narcan, which reverses the effects of an acute opioid overdose. Peckham denied the drug use, even when in the hospital confronted with positive blood tests for heroin, due to embarrassment. Mary Peckham lost her son the next year. As for pharmaceutical companies, she had this to add: “They are making money off the backs of our children.” She also faults expensive recovery programs and complex insurance issues that she feels contributed to the death of her son. Peckham recently started a support group, Matthew’s Candle, for those who have lost a loved one due to an overdose, stating that she has experienced stigma in other grief or loss-support groups because of the cause of her son’s death. Matthew’s Candle meets in Hanson, and the group can be reached at matthewscandle922@gmail.com for more information. She eventually teamed up with the East Bridgewater police, and led a coalition of local stake-holders with the goal of creating a model for law-enforcement and the community to help those suffering from addiction rather than send them to jail or prison. The fruition of their efforts is the EB HOPE Outreach Center, a twice-monthly drop-in center open on the first and third Thursday of each month from 5 to 9 p.m. at the Community Covenant Church, 400 Pleasant Street, East Bridgewater. The center is open to the community at large, not exclusively residents of East Bridgewater. The EB Hope Center can provide information about and access to a variety of services, including inpatient and outpatient detoxification programs, addiction recovery services, resources for family members (including training to administer Naloxone/Narcan and information on how to obtain the medication), and on-site mental health triage. Although East Bridgewater police personnel are present as partners of the Center and as a resource, according to Police Chief John Cowan the presence is not intended to intimidate anyone or keep anyone needing help away. He stated the purpose of the program is to help substance abusers and their families, not arrest them. The EB Hope Center can be reached at (504)-800-0942 or at www.ebhopes.net. Nearly every speaker continuously made the point that addiction can affect anyone, anyone’s family, anyone’s child, anyone’s neighbor, anyone’s friend. Addiction does not discriminate, and the public needs to educate themselves on the issue of substance abuse, as addiction is often “hidden in plain sight,” according to those who have lived it. SPEAKING VOLUMES: This aerial photograph of East and West Monponsett ponds, taken by Halifax Police Chief Ted Broderick, shows the harm drawing down water from the ponds has done. According to a law passed in 1964 to allow Brockton to take the Monponsett water as an “emergency measure,” Brockton must pay to maintain the ponds if they draw water from the ponds. The City of Brockton has turned over some documents regarding its water diversion from the Monponsett ponds, according to Halifax Town Administrator Charlie Seelig in response to a formal public records request for, among other information, the water budget for the city. Halifax has made multiple requests to secure these documents. But the requests were ignored long before the formal public records request was sent, with notable regret, according to Seelig. According to Halifax Health Agent Cathy Drinan, Brockton Water Superintendent Brian Creedon is misinterpreting– and possibly disregarding– legislation regarding Brockton’s use of water from the Monponsett Ponds, ignoring the part of the 1964 law passing on a financial obligation to the City of Brockton to maintain the Monponsett Ponds. This has angered Halifax officials as well as state officials such as state Rep. Thomas Calter who has threatened to take the matter to the Attorney General’s office, according to Driden. The legislation clearly states that Brockton has a financial responsibility to maintain the Monponsett Ponds if they are diverting water. Seelig will be going through the budget attempting to reach out to Brockton to find the money from their water department in order to fund this mandate to maintain the Monponsett Ponds so that cash-strapped Halifax does not have to. Brockton has the right under 1964 legislation, crafted during a severe drought, says Drinan, to divert water from the East Pond into Silver Lake, which is then treated for Brockton drinking water and is sold to adjacent communities. According to both Seelig and Drinan this diversion, given that water levels are high enough, can happen anytime between Oct. 1 to May 31. The diversion reverses water flow by gravity across natural watersheds, and brings water from the stagnant and algae-ridden West Pond into the East Pond, which has suffered as well from both algae and invasive weeds, though to a lesser extent according to Seelig. The East Pond has been able to stay open this year. Drinan stated that the treatment administration has helped, referring to the chemical water treatments that the taxpayers of Halifax pay for to help keep the ponds cleaner. 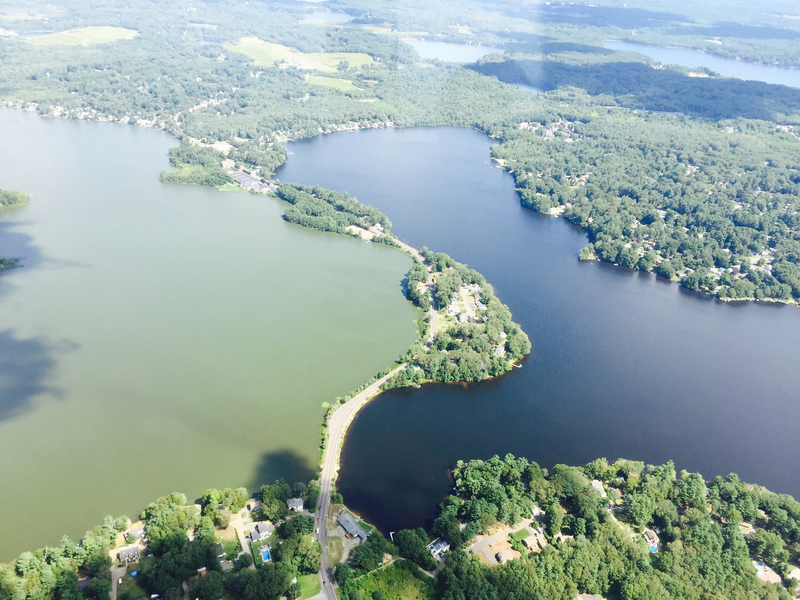 Hanson Selectman Don Howard, who also serves on the Monponsett Pond Committee, told his board on Sept. 1 that algae levels in West Monponsett Pond continue to result in advisories against any recreational use, especially swimming. Hanson selectmen are also concerned about the potential effect on the water issue should Brockton build a casino. Halifax Selectman Chairman Kim Roy has been very vocal about the Monponsett Pond “situation” for some time, and despite her anger, wants to work with Brockton officials to find a long-term solution to end the pollution caused by this practice, as do other Halifax Selectmen and Halifax officials. The Whitman-Hanson Express covers the news you care about. Local events. Local business. Local schools. We honestly report about the stories that affect your life. That’s why we are your hometown newspaper!